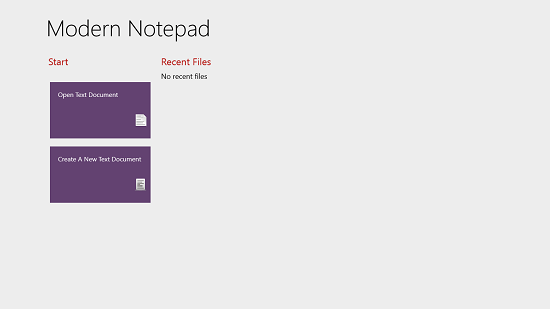 Modern Notepad is a free text editing app for Windows 8 and 8.1 devices. When you run the app on your device, the app presents you with two options – one which allows you to load up a saved text file (.txt, .rtf) or the other option which allows you to start editing a new text document. When you choose either of the options and are finally taken to the editing interface, you will see the app for hat exactly it stands – a simple and intuitive text editing app which keeps all the features of a professional notepad app. 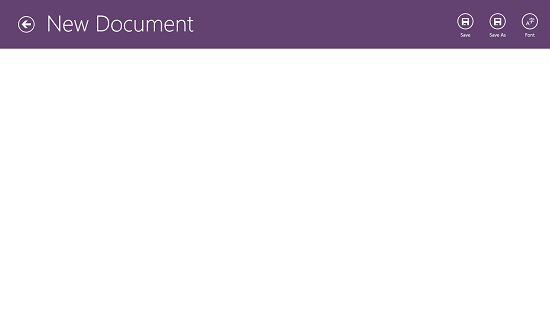 Modern Notepad is available for free from the Windows App Store. Firing up the app requires you to merely tap the tile of the app in your Start Screen post its installation. The below interface shows the main menu of the app. There are two neat tiles at the left side of the screen. Let’s talk about these. Open Text Document: Clicking on this tile will take you to the file browser interface of the native Metro environment, from where you can choose the desired file which you wish to open up on your device. Nothing more to talk about this option. 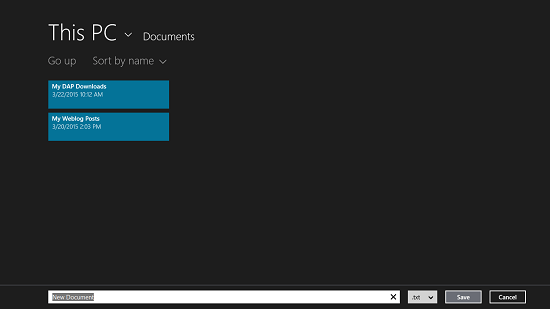 Create A New Text Document: This tile will present you with a new document interface. This is basically the text editor interface and as this tile allows you to start working on a new document, it’s needless to say that you will be presented with a blank canvas for you to type on. The below screenshot details the editor interface. You can basically type whatever you want in the editor interface, and then choose to save the file or edit the font style. To control the font style, you can either first type, highlight the font and then click on the Font button at the top right or you can directly click on the Font button on the top right screen corner to control the font style and size before you start typing. Clicking on this toggle slides out a pane from the right. This is shown below. You can set the font color, font size, background color etc. to suit your eye. You can then click on the Save or the Save As button which will present you with the below Metro interface where you can go ahead and navigate to the folder of your choice where you wish to save the file. This was a detailed look into some of the main aspects of this app. 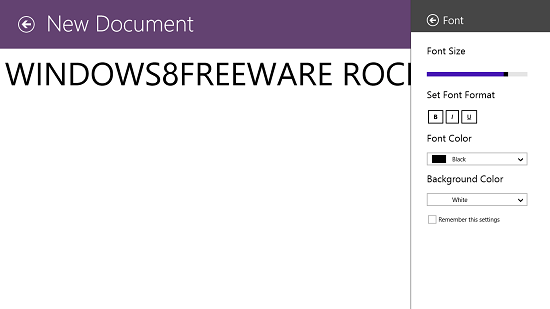 If you are looking for more such apps, feel free to check out our review of 3 Free Windows 8 Text Editor Apps. Modern Notepad is a pretty dandy app which allows you to create .txt files in style by giving the boring built in Notepad editor a pass. You can feel free to give it a roll by heading over to the link below and grabbing it for your machine.